San Francisco: Nothing says “British” like a Jaguar. When I was young nothing made you stand gape-mouthed as much as an XK-E. Lesser being drove MGs or Triumphs, distinguished men, pipe in mouth, wearing ascots and tweed jackets, often with a beautiful, leggy, and Chanel clad woman beside him, drove Jaguars. No matter how badly the marque suffered through the years, no matter how poor the quality became, Jaguar never lost its ability to make grown men weak in the knees. Jaguar made great strides after being bought by Ford. Quality improved and their lineup increased. The recent economic downturn, which sent Ford reeling, hurt Jaguar. Sales went down. But through it all Jaguar has produced some exciting cars, cars like the XKR. The XKR is the fastest, the most powerful Jag in the stable. With its supercharged 4.2-litre, DOHC V8 producing 420-hp and 413 lb-ft of torque, the 3,671 lb. coupe gets from 0-60 mph in 4.9 seconds, turns the quarter mile in 13.3 seconds, and tops out at a governed 155 mph. And while it’s doing all of this it still looks like it belongs in an episode of Masterpiece Theatre. There is only one transmission, a 6-speed automatic and there are paddle shifters on the backside of the steering wheel. Normally I do not like automatic transmissions that you can shift manually. It just seems to me that if you want to shift for yourself, you should buy a manual. But the Jag uses some interesting and fun computer programming, and the shifts are not only crisp, but also the computer “blips” the throttle on downshifts, so at least it sounds right. There was some controversy when this version of the XKR was introduced. Some felt it did not break any new ground, others felt it was not a harmonious design. I don’t pretend to be a design critic; I only know that every time I walked up to the XKR I felt good inside. Like no other car on the planet, the XKR says style and taste. The XKR is a beautiful car that evokes Jaguars of bygone eras. As one friend said of the XKR, “it looks like an XK on steroids.” It does. The XKR has wider fenders; it needs them to accommodate the larger standard tires; the huge 245/40ZR19 in front and 275/Z35R19 rears. Or you could opt for the optional massive 255/35R20 fronts and 285/30R20 rears. Normally tires of this size and performance capabilities have two big negatives, they tramline, follow lines in the pavement, and they are noisy, both from their very stiff sidewalls and open tread. Jag has done an excellent job of reducing both traits. The XKR runs straight and true at speed, and the tire noise never intrudes. Inside is everything you think should be in a British car. Well almost everything. There was nary a splinter of wood, replaced in the XKR by a unique aluminum weave design. If you want you can be a traditionalist and order the polished burl walnut veneer. There is a vestige of a rear seat, but really isn’t it more a cushioned, leather upholstered parcel shelf? I do not even know children that would fit back there. Actually I tell a lie, my six-foot plus brother folded himself up and sat back there, for about two minutes. The brakes are huge, 14” ventilated rotors in the front, and 12.8” ventilated rotors in the rear. Yes it stops as well as it goes. 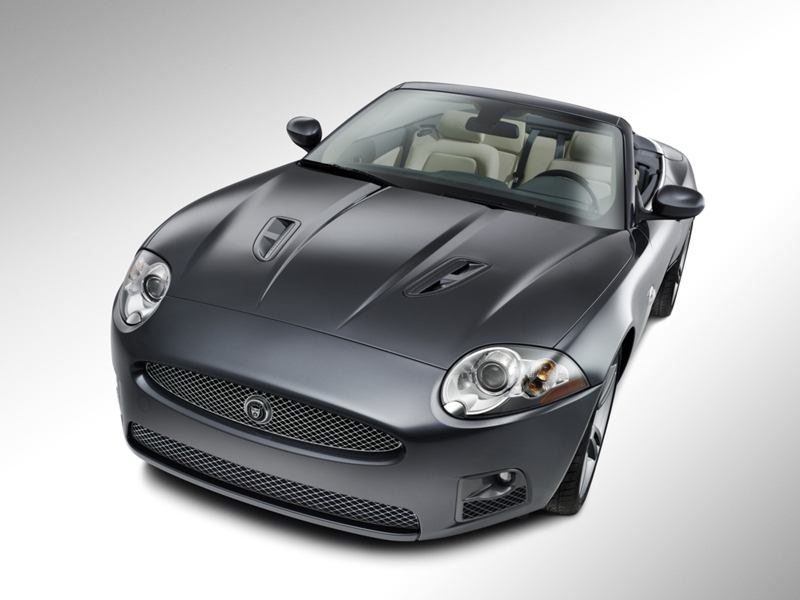 Even with its riveted and bonded aluminum body, the XKR weighs in at 3,814 lbs. You’d never know it when driving it; its agility makes it seem much lighter. Jaguar says you can get 18-mpg city and 27-mpg highway. I guess they drive much easier than I did. I can’t help it, it is just too much fun for this old gray-haired guy to smoke a few “muscle” cars without breaking a sweat. Like the XKE of old, the XKR is a luxurious sports car, I would probably call it a GT but Jaguar says it is a sports car. Fortunately due to modern electronics and technology luxury now means more than Wilton carpets and an AM radio. Now you get a navigation system, Bluetooth wireless technology, an Alpine surround sound system, power everything, an excellent climate control system, and the list just goes on and on.